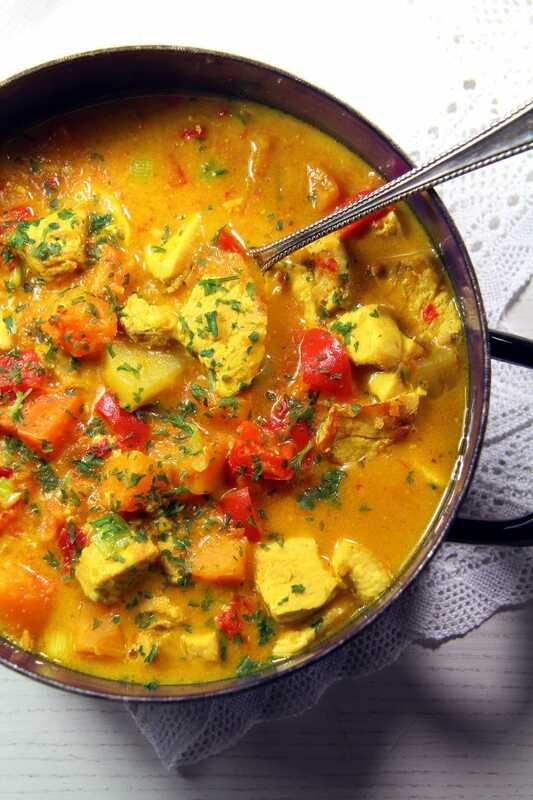 An easy to make, healthy curry recipe with Hokkaido pumpkin or butternut squash, turkey and a creamy and spicy coconut milk sauce. This is one of my favorite pumpkin recipes! I’ve made this for the first time and even posted this recipe a couple of years ago and we all like it so much that I kept making it ever since. I cannot even start to describe to you how tender those turkey bits are or how soft and sweet those pumpkin cubes. All surrounded by a creamy coconut sauce made with more grated pumpkin that makes everything complete and utterly delicious. That is the reason why I chose to post this recipe again. I feel it didn’t receive the attention it actually deserves two years ago when my blog was sooooo new, and this is a recipe that every pumpkin lover should have in their repertoire, I think. Another reason to publish it again are the photographs. Well, I really am not an expert in photography, I am still just an amateur, but I feel I have come a long way in this area since starting taking pictures of food in 2014. So, lately, every time I’ve cooked a recipe that I have posted before, I tried my best to take new photos to replace the old ones. I don’t want to hide my beginnings, but I think it would be nicer for the readers to find as many yummy looking photographs here, so when it’s possible, why not replace the old, dark and blurry pictures? And because I was speaking about “before and after” photographs, here are two old post featuring new photographs: Pumpkin Chicken Curry Lasagna and the Amazing Autumn Salad, two recipes I make all the time during the autumn season, two recipes I really really had to renew, they are really worth it! I love it when you find a recipe that becomes a favorite or just something you make over and over again. This sounds totally hearty and delicious. And I hope you get a nice surprise under the tree this Christmas. I know what you mean about dark pictures! 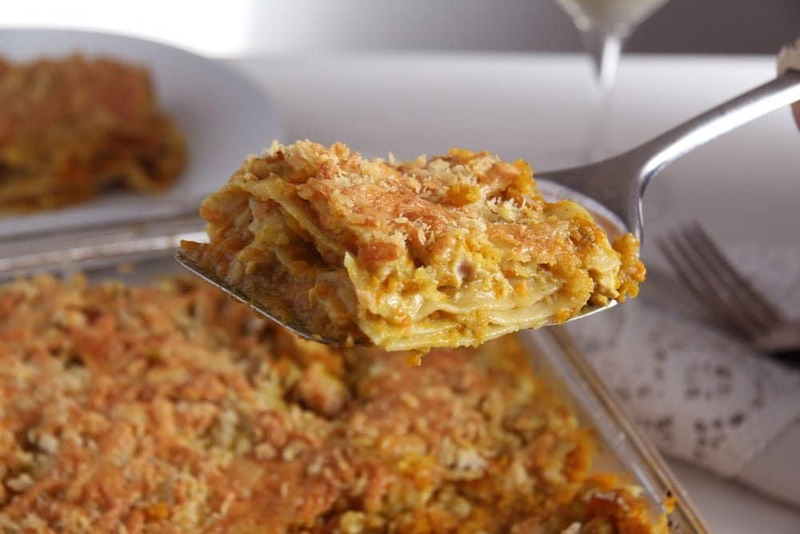 A great way to put leftovers turkey and pumpkin to use. It looks comforting and delicious!!! That looks sooo hearty. I’m kinda doing the same thing, recooking the food I’ve cooked years ago (with horrible photos ha..ha..) and updated with new ones!!! Lighting is always a problem. It gets dark very early here, so I have to plan when to make recipes. Luckily we have avoided the snow so far. 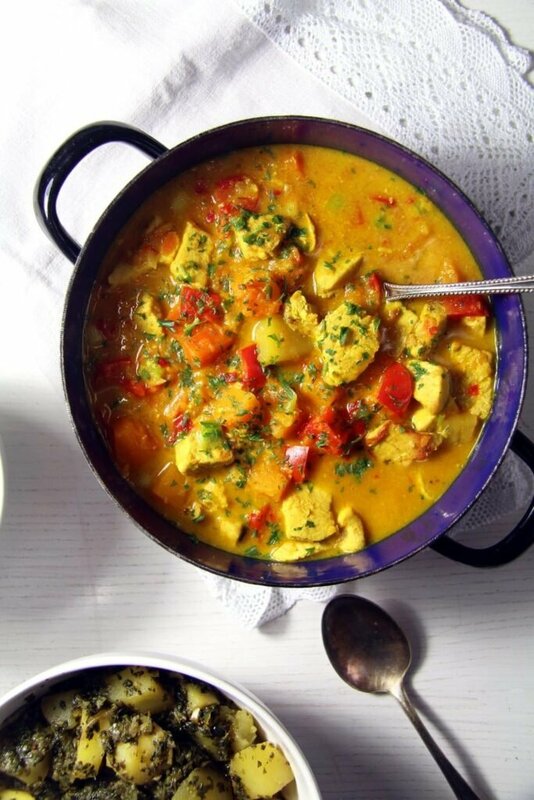 I have always wanted to try making curry and this looks wonderfully comforting. Oh, I love the sound of this recipe. 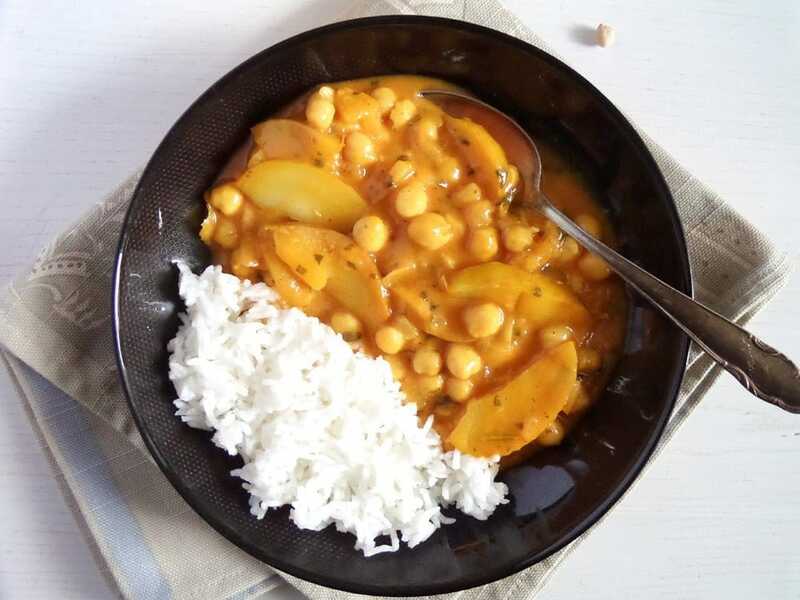 Coconut curry is one of my family’s favorite things. I bet the warm flavor of the pumpkin is just amazing in this. So glad you decided to take new photos and share again. I know what you mean by being at the mercy of light. I have one window I can shoot in front of and it’s either covered in shadow or blasted by sun – and cloudy weather will be coming soon. And, may I just say that I love your blue pot. Thanks again for sharing this recipe. 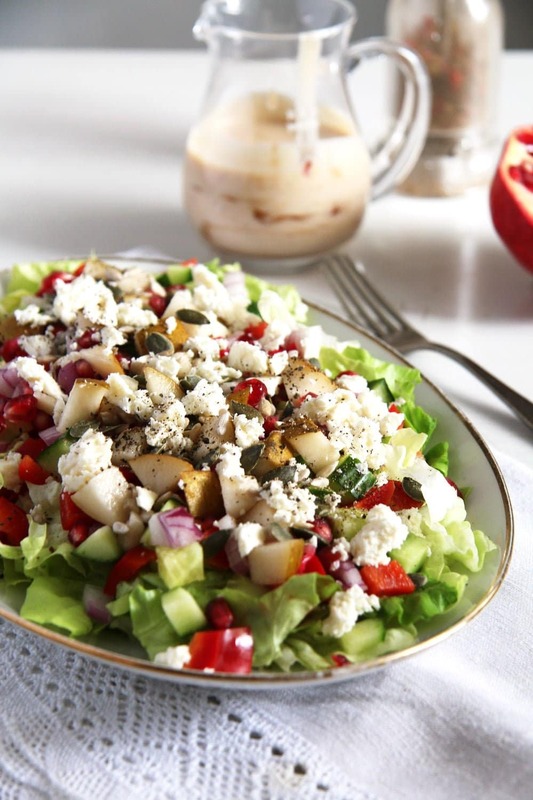 I love how you rephotographed your photos for this recipe. You’ve come so far with this blog! 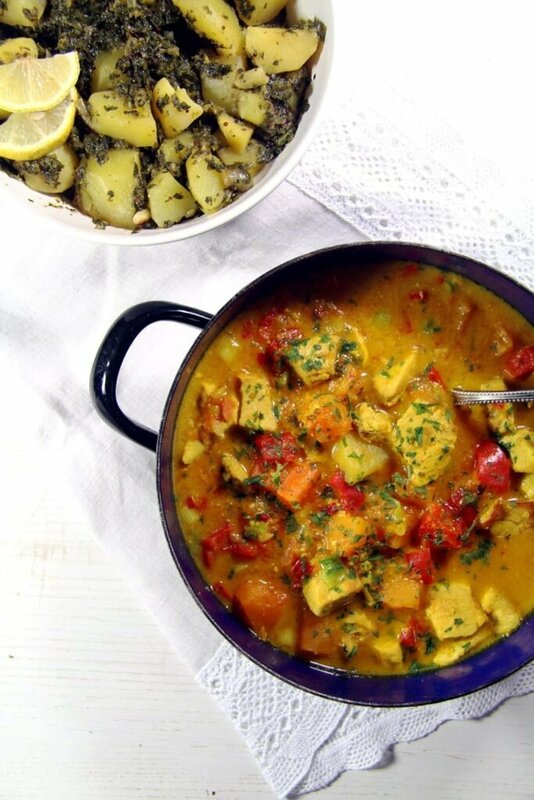 What is the other dish on the side of the pumpkin curry, looks like potatoes with ??? ?, Looks delicious. Would like to know more and try that also. Hi Lashondria. Those were potatoes with spinach and lots of spices. If I manage to remember where that recipe is, I will email it to you. Hi Adina, Many thanks for a lovely recipe. 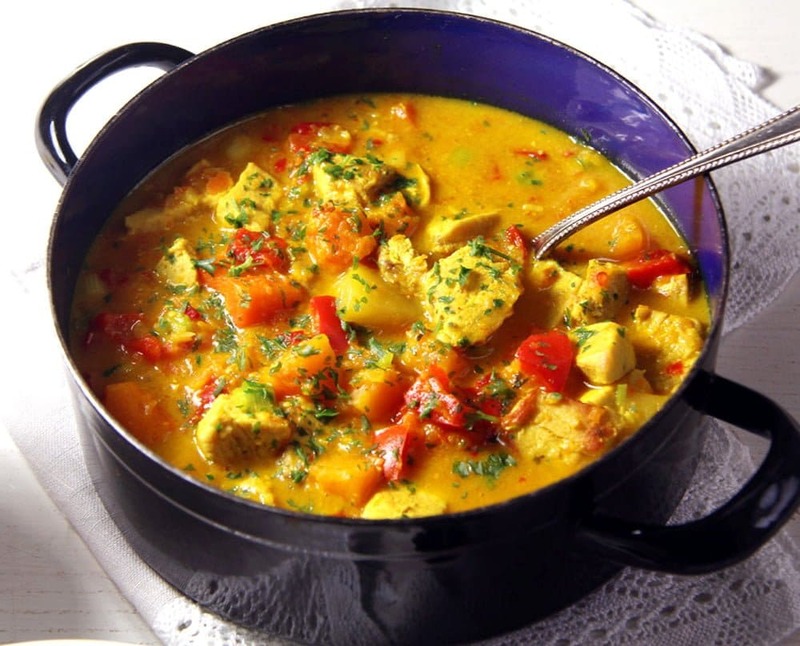 Tumeric, while such a great spice and good for you, is not enough flavor for me in a curry, so I added a spoonful of my favorite English spicy curry to the pot…but I could not have come up with the wonderful mixture of vegetables and turkey without your basic recipe. Wishing you sunny autumn days….I am also in Germany where the days are very short in November. Hi Peggy, thank you for your feedback. 🙂 Yes, the days are short here now, but still so mild, don’t you think? I have never experienced such a mild November.